Our Whole Woman’s Health clinics lead the nation in abortion care for your body, your mind, and your heart. 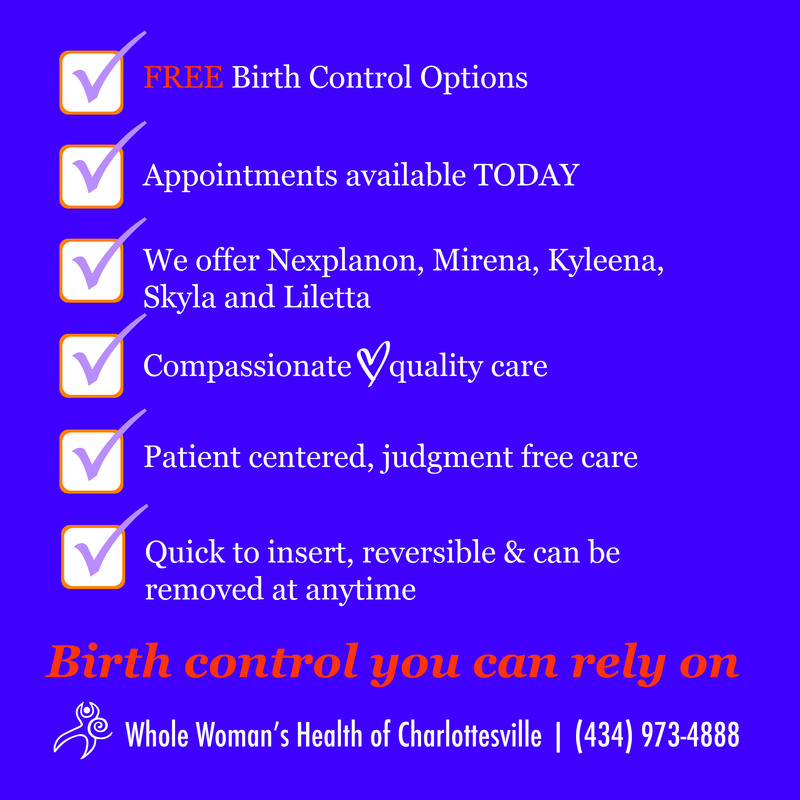 Part of this care includes birth control, and we are proud to announce that our Charlottesville clinic is offering free long-acting birth control. This birth control includes long-acting reversible contraceptives (LARCs), and these come in the form of IUDs or implants. What are the benefits of getting a LARC? There are several benefits to getting a LARC, and many patients find they are a better fit for their busy lifestyle. However, favorable types of birth control vary from person-to-person, and you should consider all options before making a decision. It is important to note that using a LARC does not prevent STDs and/or STIs on its own. It is recommended to use a LARC along with a condom to help prevent STDs and STIs. What types of LARCs are available at no cost? Mirena is a hormone-releasing IUD the prevents pregnancy for up to five years, and is also the only FDA approved IUD that also treats heavy periods. For more information, please visit Mirena-us.com. Nexplanon is a birth control implant that’s inserted in the arm. It provides three years of continuous pregnancy prevention and is reversible. For more information, visit Nexplanon.com. Skyla is a hormone-releasing intrauterine device (IUD) that prevents pregnancy for up to three years. For more information, please visit Skyla-us.com. Kyleena is a hormone-releasing IUD that prevents pregnancy for up to five years. For more information, please visit Kyleena-us.com. Liletta is a hormone-releasing IUD that prevents pregnancy for up to five years (originally four years, but was recently indicated up to five years). For more information, please visit Liletta.com. Who qualifies for the free birth control? Currently, we are offering free, or no-cost to the patient, LARCs to those who are uninsured or underinsured, with incomes below 250% of the poverty line. If you think a LARC is right for you, please give us a call to see if you qualify for our no-cost option. You can also set up a time to speak to someone about your birth control options.